Ultimate Hearing custom earphones Picture: Alan Dowds From: Ultimate Hearing Protection Price: £180 Sizes: Custom-made for your requirements! Listening to stuff on the bike is a controversial topic - plenty of folk reckon it’s dangerous, and distracts you from the road. I’m in the other camp though - just as in your car, having the radio or music on is a useful mental adjunct to the riding process, and I don’t find it a problem. Long journeys, in particular, are transformed if you can listen to tunes or your favourite talk radio show, and I wouldn’t set out for a big trip without some means of audio transmission. And over the years, I’ve found this to be by far the best solution. The Ultimate earphones are a life-saver for boring big journeys, and the perfect way to pipe audio into your head. The problem is simple enough: riding a bike is a very loud experience, and even a quiet helmet and big fairing doesn’t stop masses of wind and engine noise. Putting speakers on a bike or even inside your lid doesn’t stop that noise, so to hear anything, you need to crank up the volume massively - which will cause further damage to unprotected lugholes. If you wear normal earplugs, then it’s even harder to get the soundwaves you want to hear into your ear canal. So the simple solution is the best: have an earplug which blocks outside noise, yet also contains a little speaker to transmit sound inside your ear. Cut wind noise massively, and then a comparatively quiet sound signal will still be audible to you. Win/win. 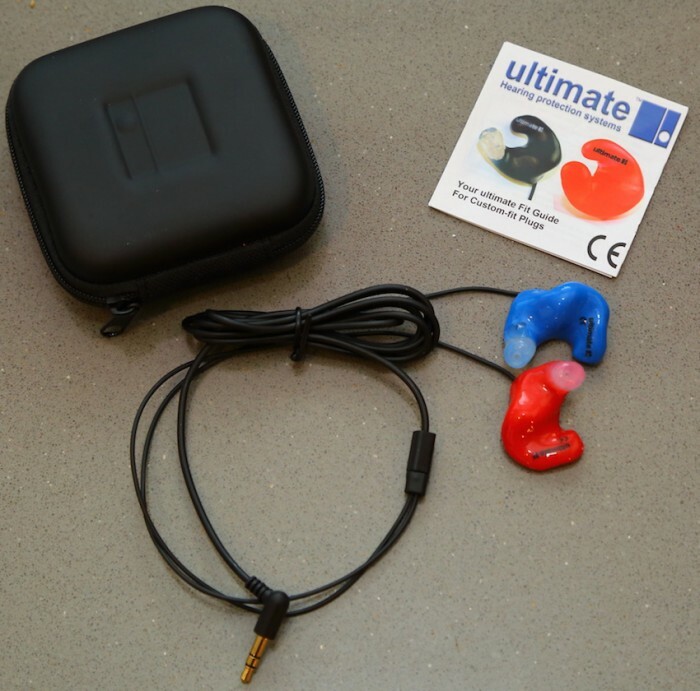 Ultimate does this by making a bespoke moulded silicone earplug, which exactly fits your ear. The firm’s techs use a quick-setting polymer to make a cast of your ear canal, and use that to mould the ear plugs. A set of quality earphone monitors are moulded in, and voila: a perfectly-fitting earphone that plugs into phone, iPod, sat-nav, Bluetooth gizmo, whatever. I’ve had a few of these over the past decade or so, and they’ve been great. The only downside is that they get a tough life, and can wear out (or get lost) over time. Indeed, my first pair got wrecked after the wire wrapped round the bike and got pulled out, and I lost my second set recently. The build quality has improved since my first set, and they’re much tougher now - though they’re still quite easily lost. I’ve tried to combat this with this current set by having my website and Twitter name etched onto the plugs. The other thing is that your ears change shape over time. Who knew? My latest set were about four years old, and had felt a little bit loose of late. So a trip to Ultimate in Orpington saw a fresh mould of the Dowds lugholes, and the new plugs fit like, er, a glove?